After the thrill of those first shavings from the Veritas block plane I wondered what else I was missing out on in the hand tool world. Still somewhat new to the craft, I was more bent on working with wood than doing in depth Internet R&D. I have been involved with hobbies where more time was spent researching than participating (which sometimes is part of the fun), but I was determined to avoid this trap with woodworking. If there was available time, it was to be spent making in the shop. Regardless, I began to look into basic hand tools. 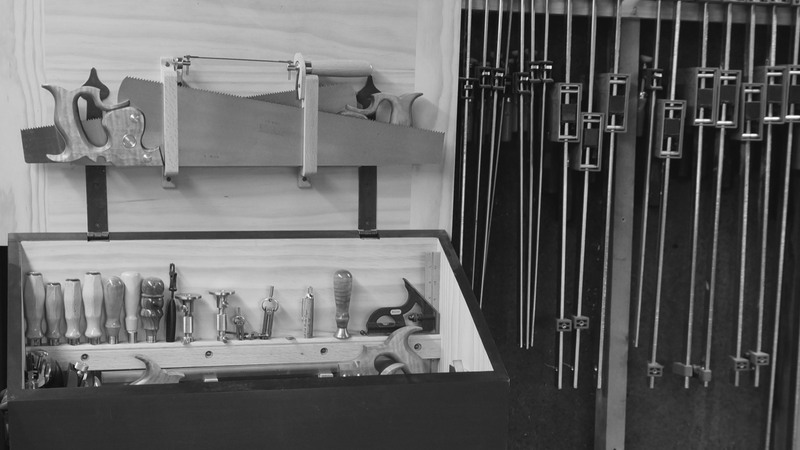 It did not take long for the Anarchist’s Tool Chest by Christopher Schwarz to surface. A book (and accompanying video) about the essential hand tools needed in a wood shop was exactly what I was looking for. 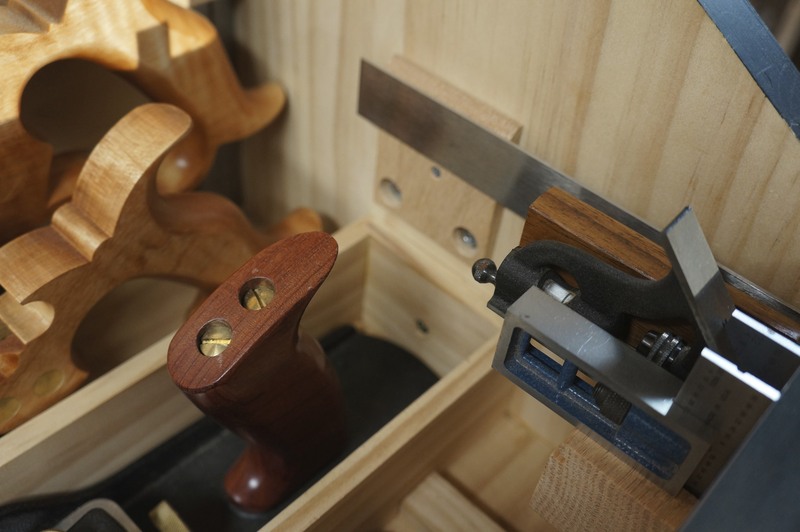 Much has been written about the ATC in the woodworking community. 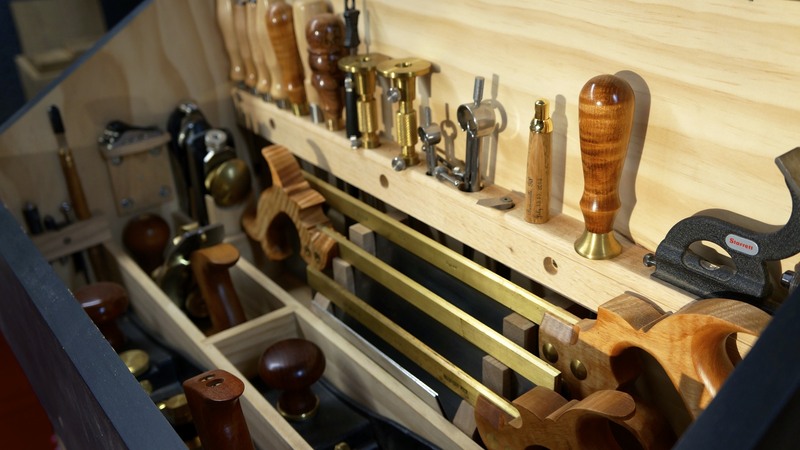 For someone new to hand tool woodworking, it has been an invaluable resource for guiding and prioritizing tool selection. The title clearly suggests a message beyond the tools – and it does challenge the disposable approach to consumer goods, the importance of creating and making, and supporting the individual efforts of those who create quality goods and services with meaningful purpose. So I began obtaining and incorporating hand tools into my woodworking projects. As my collection of hand tools grew, I stored them in a bright red Snap On toolbox. Not the most ideal or convenient home for the tools, it did keep them protected and relatively dust free. Although a fan of the ATC book in general, I was not particularly keen on the English tool chest design for a couple reasons. First, my shop is in a slightly oversized two-car garage – and I am adamant about parking two vehicles in it. I did not want to take up floor space with a large box that needed head clearance for opening a lid. Second, despite a clever layout using sliding trays, it seemed like you had to still shuffle things around a bit to get to the tools, and bend over in doing so. Since my tools stay in the shop, I decided to build a hanging wall cabinet. I didn’t have a proper bench, but I knew where it would be placed once I did – and there was a nice spot on the wall in close proximity. 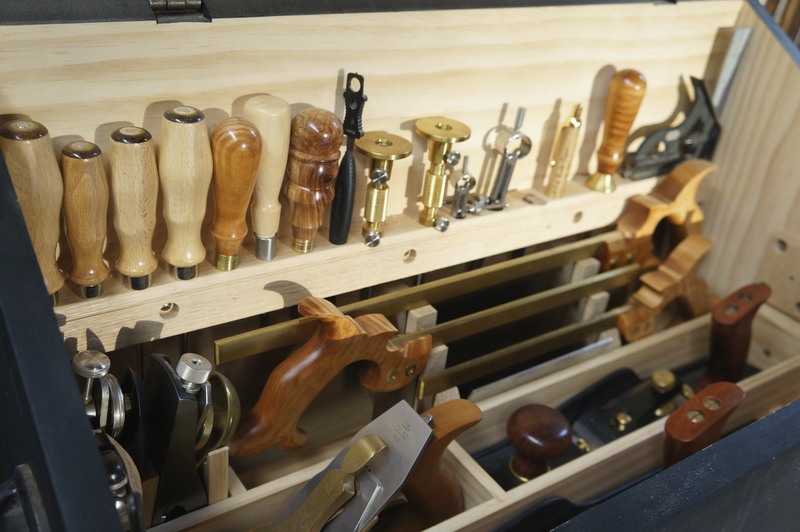 As I researched a good cabinet design for current and future tools, I stumbled upon an opportunity to make an heirloom quality workbench (more on that later – hint: FORP). So now I hand an opportunity to take my tools on the road – at least once. Around this time Chris posted a series of blog posts and videos about a tool chest of Dutch origin. To my eye, this chest had a series of advantages over the English counterpart: a more compact footprint, easy to stack on a rolling chest, and possibly even wall mountable via French cleat. The tools were logically positioned inside, all accessible without moving or sliding anything out of the way. If elevated off the floor, the tools could be retrieved without the need to stoop or bend over. And unlike a wall cabinet, it was portable. I read on the Lost Art Press blog that Chris would have his Dutchman on display at the Lie Nielsen event at Popular Woodworking’s headquarters in Cincinnati. I live just north of the city, and had never been to LN event, so I thought I would take the opportunity to check both out. 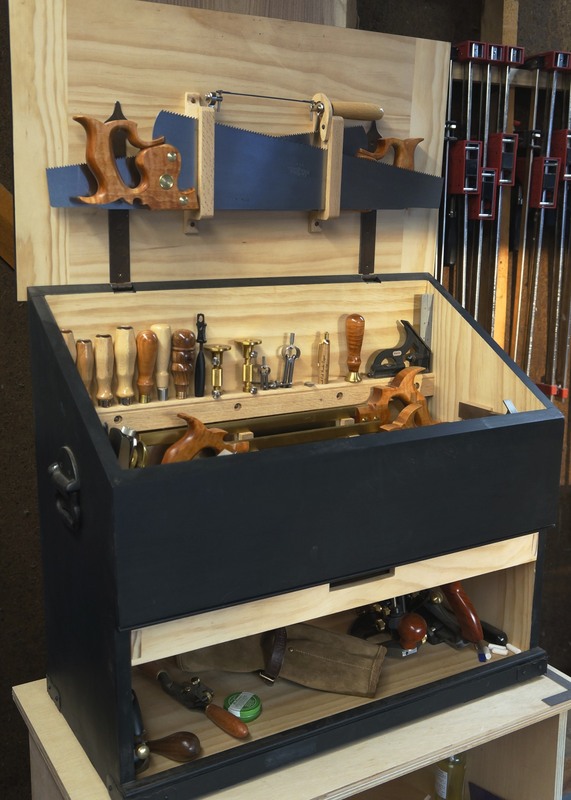 After seeing it in person, I knew that the Dutch chest was the right choice for my shop. Chris kindly e-mailed the SketchUp drawing, but insisted the only key dimension was the 30-degree lid angle. The rest was open for interpretation. So I set about the construction, using pine for the case and white oak for the tills and accoutrements. To the sides I dovetailed the base, screwed the tongue and groove back, and Miller Doweled the front panel. Lee Valley strap hinges were used to attach the breadboard top, and black General Finishes milk paint was the final touch. 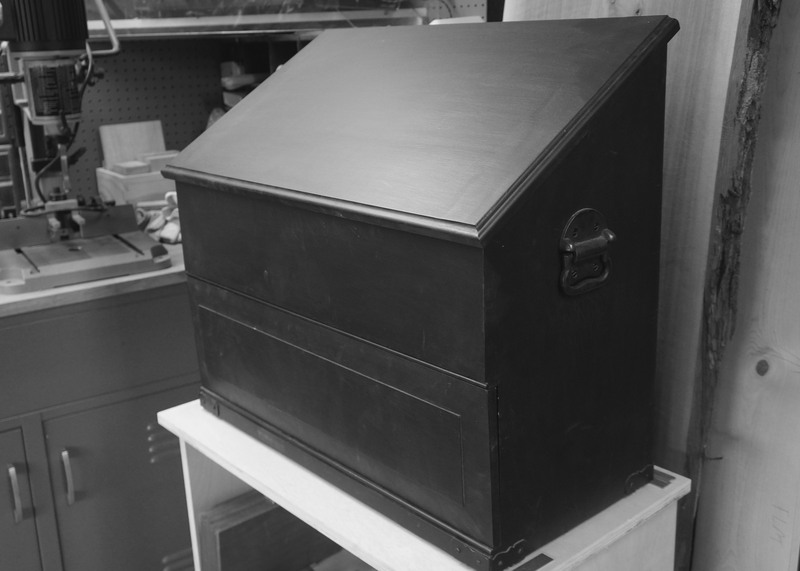 I currently keep the chest on a plywood cabinet on casters, but will ultimately make a small chest with similar design features found on the Dutch. It is a pure joy to work out of this chest!